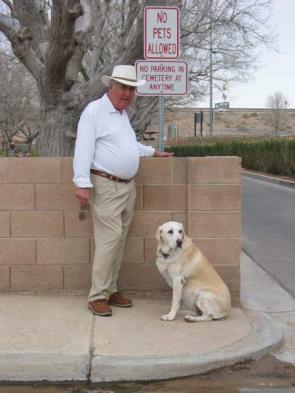 Larry Peterson and his dog stand at the entrance to the Mesquite Cemetery, in Mesquite, Nevada, where they do not allow dogs, however, the cemetery does allow mass murders to be buried there. Mesquite resident and loyal supporter of the Mountain Meadows Monument Foundation, Larry Peterson, researched, and searched until he found the gravesite of Nephi Johnson, Nephi Johnson was one of the most sadistic and brutal killers involved in the Mormon massacre of gentiles at Mountain Meadows , Utah on September 11, 1857. 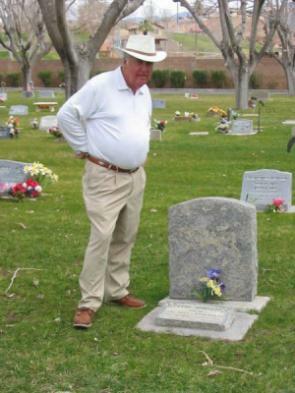 Mr. Peterson advised us that most local residence didn't know that Nephi Johnson was buried in Mesquite, Nevada. Mr. Peterson immediately notified the Phil Bolinger, President of the Mountain Meadows Monument Foundation , the most representative of the descendants groups, of the location of Shooter and Clubber Nephi Johnson's gravesite. The LDS Church has knowingly sponsored, endorsed, and forever immortalized this butcher into history. The above is a quote from author Larry McMurtry's audio book "Oh What A Slaughter".